Palestine Real Estate & Palestine TX Homes For Sale | BuyPalestine.com FSBO: Should You "DIY" Real Estate? 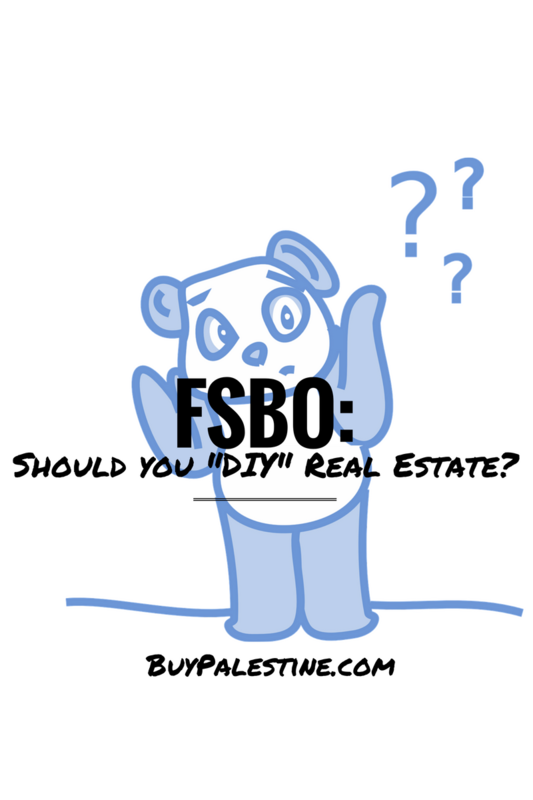 FSBO: Should You “DIY” Real Estate? Will you work the paper or will the paper overwork you? It’s going to be stressful, no matter which way you go—it’s just a different type of stress when you are the one in charge of it all. When you’re selling by owner, you’re on your own–it’s DIY, after all! You are the point of contact between yourself, the buyers, the title company, the bank and any other vendors involved. The laws and regulations are always changing, and the laws still apply to you, so you need to be familiar with all necessary paperwork. Purchase contracts are complex and must be written correctly to be valid and enforceable and to avoid litigation. Small errors can cost thousands of dollars, so knowledge is key. The price is of highest importance. Proper pricing is definitely a mixture of art and science. However, not even a million dollar budget will sell an overpriced home, so don’t set yourself up to fail with bad pricing. It pays to know the comparable sales and competition, so you are priced right and can find a buyer fast. Pricing must be looked at objectively, completely absent of emotions, as the house is no longer your home but is now a marketable commodity with a price tag attached. Yes, you will “save” the commission…but make sure you really are saving at the end of the day! Many buyers view FSBOs as a possible “steal” because they know the owners are saving on paying a commission, so they want in on the savings too with a lower purchase price. According to the 2015 National Association of REALTORS® Profile of Home Buyers and Sellers, the median sold price of a FSBO sale was $210,000 compared to the $245,000 median sales price of all homes. $35,000—that is a BIG difference. It may not be typical for every sale, but the only transaction you care about it yours, so always be aware of your bottom line. If the numbers work, fantastic; but look at the big picture—don’t lose thousands in profit just to save on a commission that may be less than what you’ve left on the table during negotiations anyway. There’s no way around it, selling your home will take time out of your schedule, so plan accordingly. Real Estate is not a 9-5 job. There may be someone who can only look at the property at 11:30am on a Tuesday or at 4pm on a Saturday. You must be prepared to use your free time to get the property sold. You must make time to take calls from prospects and learn how to screen the buyers from the lookers, schedule showings, meet inspectors and appraisers, prepare the contract forms, liaise with the lender and title company, along with any other tasks needed to selling the property. These steps to selling take time and time is valuable—just make sure you have it to spend! FSBO may or may not be the right choice for you. I don’t begrudge anyone who wants to go FSBO, but it is important to know what you’re getting into before you start the process. If it is the right path for you, that is great! REALTORS® may make it look easy, but selling real estate is more than a full time job—you may be saving the commission, but nothing is free.